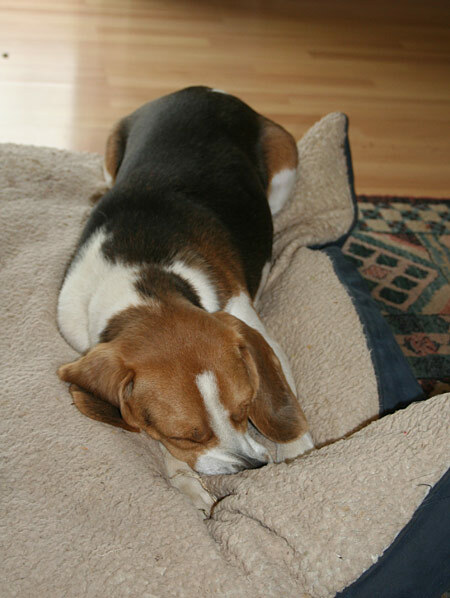 Whenever I ask, “Does your beagle do this?” the answer is invariably “Yes!” So I will assume that Stanley is not the only one with this endearing habit of grasping the doggy bed with his front paws and sinking his teeth into it, then remaining motionless for awhile. This is not to be confused with grasping the doggy bed in his mouth and dragging it around the house. He does that too, but in those rare moments of the day when he’s not moving, he can frequently be found like this. It’s like Linus with his thumb and security blanket and it’s so cute! How is this night different from all other nights? 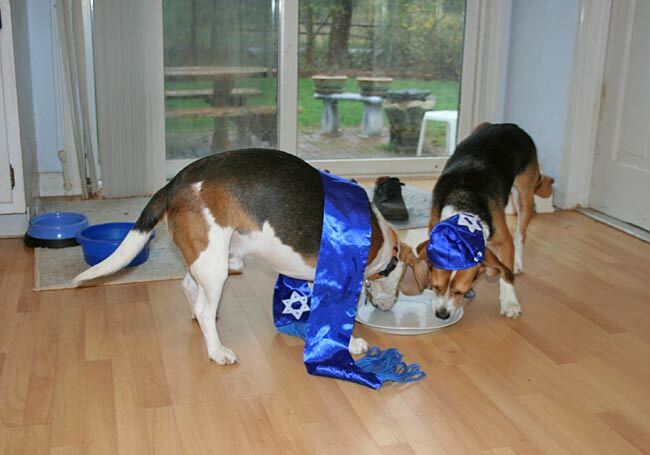 Because it’s time to dress up the beagles in their Passover regalia! I hope everyone had a nice Seder. We’re actually waiting until the weekend to get together with Phillip’s family in Connecticut. And you know what that means — more pictures of Moses! Next Monday, I promise. 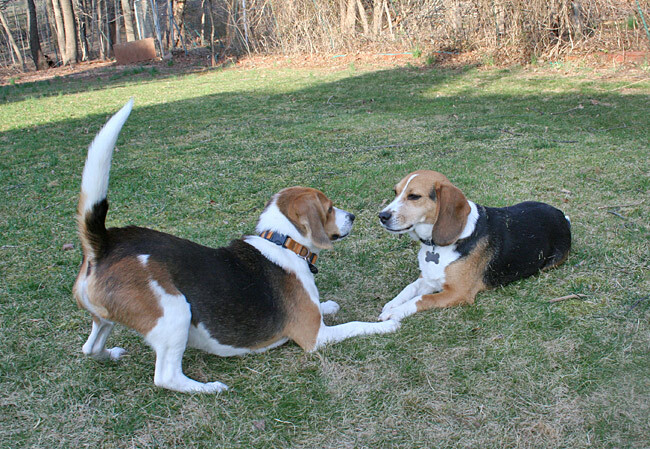 Congratulations to Sammie & Freckles Beagles, the winners of this week’s caption contest for: Right Paw GREEN… Twister is awesome! The runner-up is David for The world’s quickest game of hide and seek. 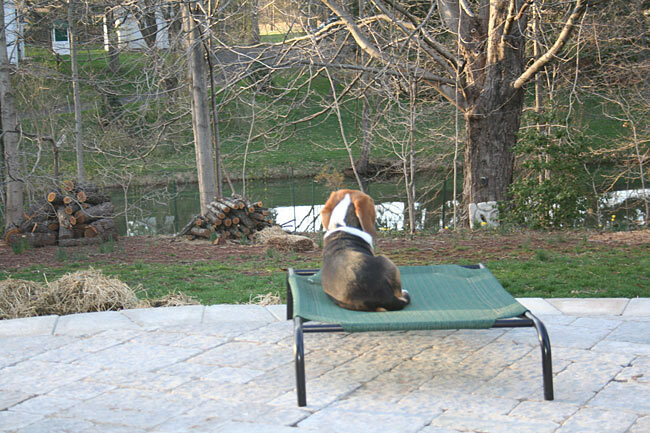 Hmmm, now what could Sherman be looking at so intently? A bird? A squirrel? No! 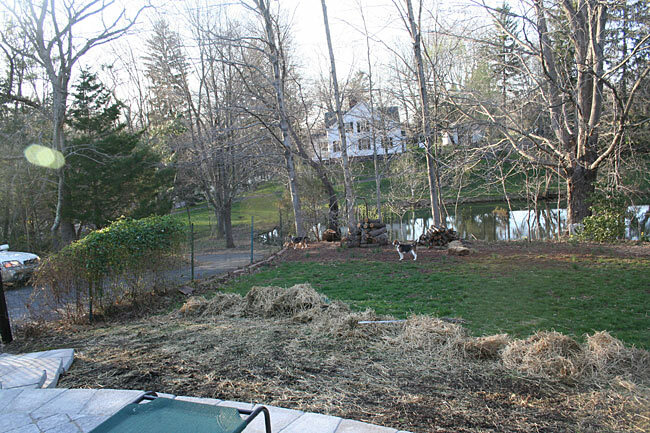 He is gaping in astonishment at the transformation of the yard into a cow pasture! When they built the Taj-Mah Patio, they had to dig up the ground and they kindly left grass seed covered by straw. I wanted more straw in anticipation of the mud season, so Phillip went out and got some but unfortunately they were out of straw, so he got hay. There’s a big difference betweem straw and hay, did you know that? Straw is comprised of the stalks of grain plants while hay is everything but the stalk with plenty of seeds. So it should be interesting to see how the “grass” comes in over the next few weeks. 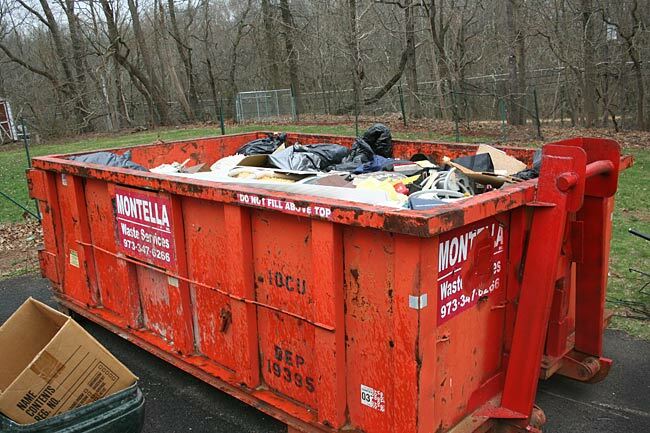 In the meantime I’ll be looking for a cow or two to get rid of this mess. Those of you with boy beagles have seen this a million times. 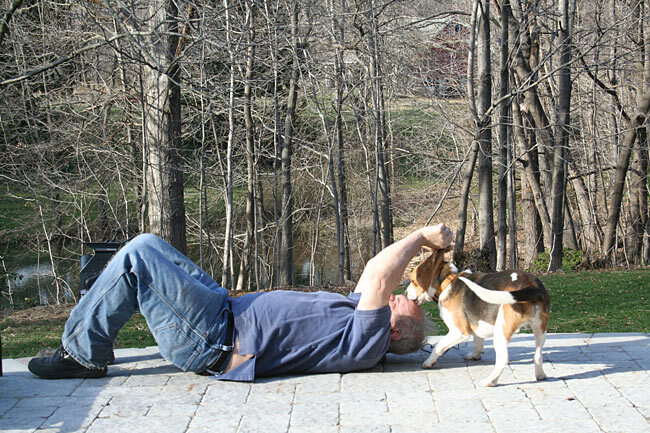 Boy beagle #1 identifies a peeing spot, circles around it a couple of times, lifts one leg — NOPE, then the other. Pees for about 1/4 of a second. Maybe 1/3. Boy beagle #2 furtively moves in. Sniffs. Realizes that Boy beagle #1 had indeed left his mark. Circles around furiously trying to find the best position. Looks away, pretending not to notice. Pees for 1/2 second. Goes on his merry way. 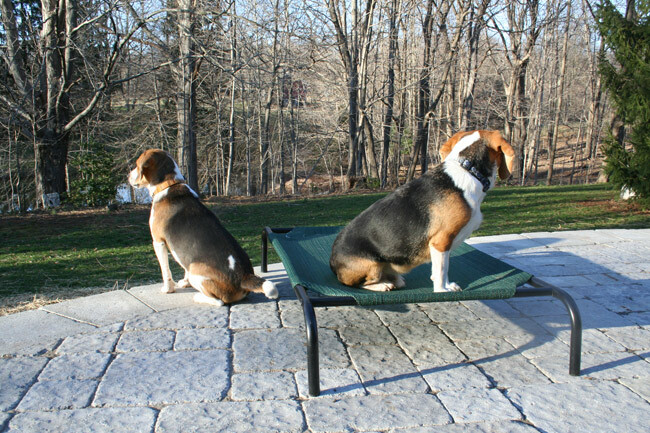 Occasionally the first beagle will return, I used to see that a lot with Clayton, Spenser and Scooter. 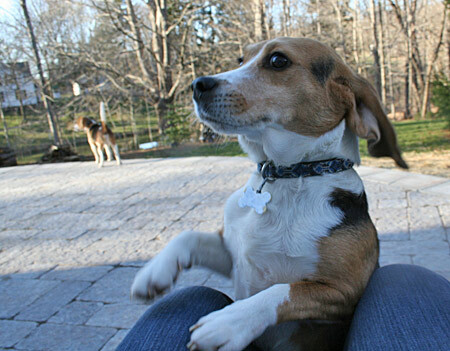 Do girl beagles have this same bizarre ritual? Oh, and chives? They grow in large clumps all over the yard in early spring. We had extraordinary weather this past weekend: sunny and in the mid 70s on Saturday, just a bit cooler on Sunday. When was that last winter storm, three weeks ago? Now everyone is out in shorts and t-shirts. Phillip even put the snow shovels away in the shed, which is a risky move and I hope that the snow gods weren’t looking. The boys spent a lot of time outside, helping Phillip with the yard work, sitting in the sun on the patio, chasing each other around the yard. Not much in life beats the wonderful feeling of spring, you know? Many thanks to Linda for today’s nickname for Sherman. I love it. We took the boys on a walk on the canal path the other night, the water had receded and it was pretty dry. As soon as Stanley got his first sniff he became a howling banshee. Stanley can NOT be off the leash and I prefer Phillip to walk him because, despite all the swimming I do, this 25-pound dog is stronger than I am. That made it easy for me because Sir Sherm-a-lot can be off leash. 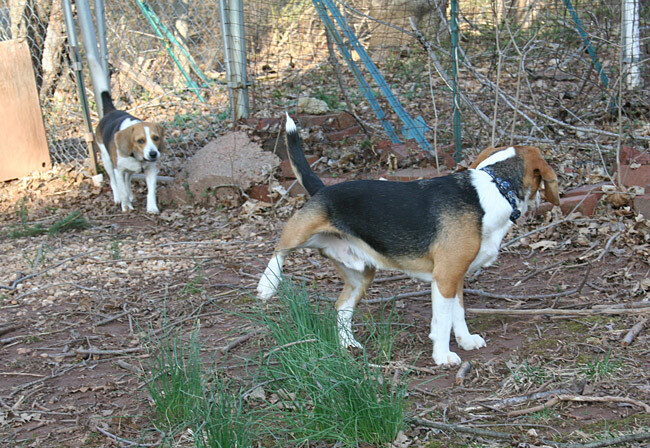 He likes to walk just behind Phillip (who is being pulled by Stan at speeds approximating those found in a cyclotron) but he’s a beagle and he stops frequently to sniff and pee. This causes him to get behind, and if the distance exceeds more than about 10 yards, he goes into a full gallop to catch up. “Wait for me! !” He’s just as cute as can be, that Sir Sherm-a-lot. Yesterday’s weather was glorious! Sunny and in the 60s! The few Princeton students who weren’t in the Caribbean on spring break were all wearing shorts, t-shirts and flip flops. I’m too old for that, but I did spend some quality time after work on the Taj Ma-Patio. With my boys, of course. The one that eats bottle caps, and the one that doesn’t. 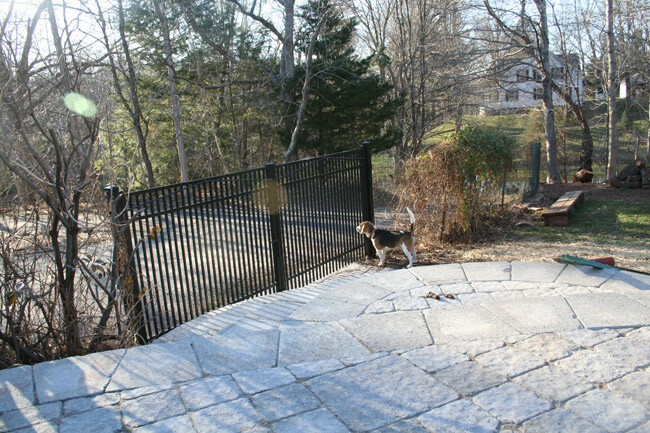 We decided that the Taj Ma-Patio would benefit from a nice gate at the Taj Ma-Steps. And it’s quite nice, don’t you think? But as soon as we saw it installed we realized how much it needs a Taj Ma-Fence. Not all the way around the yard (we want to keep our retirement savings) but just the small stretch down the driveway. Stay tuned.